Way back in December, I entered a giveaway. A kitchen-things giveaway. Sounded like a good idea to me. And luck would have it, my name was drawn. How ’bout them apples? So a few weeks ago, I receive a package in the mail. The hubs immediately accused me of shopping on eBay. I hadn’t. He just goes around accusing me of stuff all the livelong day. But it wasn’t anything I’d gotten from the interweb. 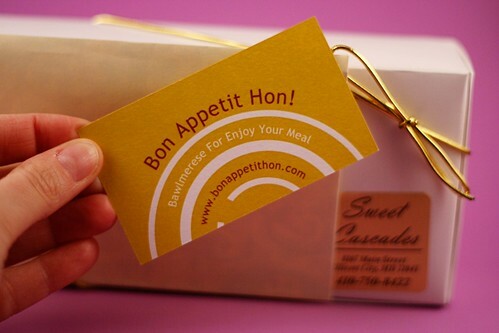 It was my prize from Wendi at Bon Appetit Hon. And inside was a microplane. I’ve never owned a microplane but I’ve always wanted to microplane things. My goal was to get my kitchen as messy as possible and whip out my microplane to grate some cheese or chocolate or lemon zest and photograph myself doing it. But everything that I’ve made lately has not required said microplane. Unless it doubles as a can opener. But I will. Cross my heart. Hope to die. Stick a needle in my eye. I will photograph myself with that sword-like kitchen tool. But I couldn’t wait any longer, I had to tell you what else was in that box. Like any savvy business woman, she included her card. And a hand-written note. I love getting letters in the mail [that don’t involve collection agencies]. 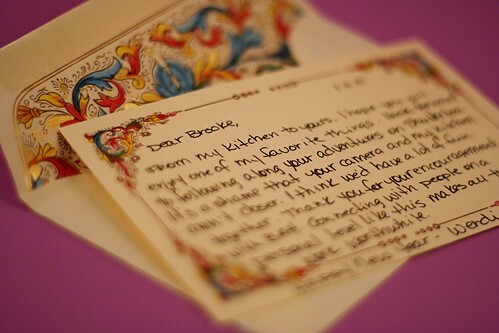 I had pen pals as a child and that feeling of getting a special note with a stamp on has never died. You’re probably wondering what that white box was. That, my friends, was a piece of the North East. I opened it and inside were about 10 little crab-shaped chocolates. I immediately knew they were the Old Bay crabs Wendi had talked about on her blog. And then I consumed them. So I have no pictures. So sorry. ~ by shutterboo on January 26, 2010. Brooke, you have totally made my day. And can I just tell you there was a surreal moment when I pulled up the post and saw the business card and thought, hey, I’ve got cards like that too. Yeah, I’m slow like that sometimes. Isn’t that the most beautiful note paper ever? A friend brought it back from Italy and I only ever use it for special cards. Can’t wait to see you channeling your inner Micro Plane Jedi. Sadly, Micro Plane is woefully ineffective as a can opener. But in a pinch, you can pretend it’s a light saber.